It was something of a quiet week on the new release front as the top new release at the box office this weekend, Smurfs: The Lost Village, came in third behind Boss Baby (which I guess I'll have to see eventually) and Beauty and the Beast with an estimated $14 million. This may seem odd as The Smurfs were once titans of the summer movie seasons child demographic, but this was the first full animated Smurfs feature whereas the 2011 ive-action/animated hybrid debuted to a strong $35.6 million eventually going on to gross $142.6 million domestically. Unfortunately, the sequel could only open with $17.5 million in 2013 and The Lost Village seems to only be continuing this downward trend. We're not here to talk Smurfs though as we decided to go with what was entertainment squarely aimed at the older crowds (which probably isn't what you want to do when you have a YouTube channel, but oh well). This week we discussed Going in Style, the latest film from Zach Braff that stars Alan Arkin, Morgan Freeman, and Michael Caine a three lifelong pals who risk it all by embarking on a daring bid to knock off the very bank that absconded with their money. With a light, fun premise and the kind of credentials this cast inherently brings with it Going in Style actually outperformed for much of the weekend, but was still only able to muster up a fourth place finish for the weekend. This is one of those scenario's where ranking hardly matters though, as Tthe film is debuted in 3,061 theaters and going into the weekend was only expected to open with around $8 million. 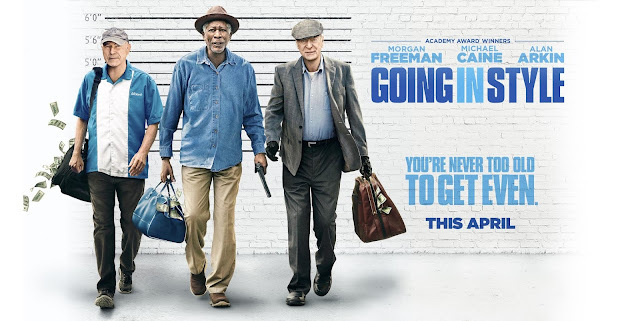 Cut to this morning and Going in Style had a reported $12.5 5 million opening domestically with another $4.3 million worth of tickets sold internationally. With a reported budget of $25 million it seems this one will have the legs and lack of competition to easily recoup its budget and then some. That's all for this week, but as always be sure to follow us on Instagram, Twitter, and subscribe to our YouTube channel as we have a new review (or reviews) up each week! Read my full Going in Style review here.